Banking is the backbone of an economy. All sorts of economic and financial activities revolve round the axis of the bank. As the industry produces goods and commodities, so does the bank creates and controls money market and promotes formation of capital. From this point of view, banking-a technical profession- can be termed as industry. Services to its customers are the products of banking industry besides being a pivotal factor in promoting capital formation in the country. As all economic and fiscal activities revolve round this important ‘Industry’, the role of banking can hardly be over emphasized. Circumstances’ being such, it becomes imperative to find out the role that now playing in the country and analyse its operational aspects so as to ascertain the importance of this delicate financial sector and it’s over all impact on our national economy. To ascertain the role of banks and to analyse its operational aspects and its overall impact on our national economy a through study as to its distribution, expansion and contribution is essential to comprehend its past, present and future bearings for the growth and development of the banking sector of the country. In the global context, the role of banks is far – reaching and more penetrating in the economic and fiscal discipline, trade, commerce, industry, export and import- all carried through the bank. Banks are the only media through which international trade and commerce emanate and entire credit transactions, both national and international. Each professional degree needs practical knowledge of the respective field of discipline to be fruitful. The report entitled “Credit Risk Management.” originated from the partial fulfilment of the internship program. The main purpose of the preparation of the report is due to the partial fulfilment of the internship program phase of the MBA Program conducted by JagannathUniversity. During the internship program, I was under the supervision and guidance of Majeda Sultana, Assistant Professor, Department of Accounting & Information Systems, Jagannath UniversityBangladesh. Moreover, during the attachment to UCBL, I was under the supervision and guidance of Samsun Nahar, AVP, Donia Branch, UCBL. Broad objective: – To identify the process of the credit risk management. To apply theoretical knowledge into practical arena. To be familiar with banking management system. To evaluate the performance of credit division. To familiarize the working hours, values and environment of the book. To familiarize different rules and regulation of loan and advances formalities. Both primary and secondary data are used here in this study for make the report fruitful. As my related topic is more narrative I have used the primary source as the main of information. To continue study in such a vast are requires a big deal in time. As an internee I had only three months time which is not enough. To collect information I faced difficulty because of the excessive nature of confidentiality mentioned by the officials of United Commercial Bank Ltd. Available data also could not be verified. In most cases I simply did not have any option but to furnish with data verification. It requires lot of assistance from all level officers and staff but as a bank the officers were busy in doing their jobs. The study was limited by the availability of the data. Some of the supplied information was contradictory. UCB had sponsored by some dynamic and reputed entrepreneurs and eminent industrialists of the country. UCB started its operation in mid 1983 and has since been able to establish the large network of 130 branches as on 01 January 2012 among the first generation banks in the private sector. With its firm commitment to the economic development of the country, the Bank has already made a distinct mark in the area of Private Sector Banking through personalized service, innovative practices, dynamic approach and efficient Management. The Bank, aiming to play a leading role in the economic activities of the country, is firmly engaged in the development of trade, commerce and industry thorough a creative credit policy. The Bank has in its Management a combination of highly skilled and eminent bankers of the country of varied experience and expertise successfully led by Mr. Nurul Rahman Khan, a dynamic banker, as its Managing Director and well educated young, energetic and dedicated officers working with eagerness for the growth and progress of the institution. Year of Incorporation: June 26, 1983. To be the bank of 1st choice through maximizing value for our clients, shareholders and employees and contributing to the national economy with social commitments. To become the leader in the industry attaining highest level of customer satisfaction with strong corporate culture and good governance. To introduce fully automated systems through integration of ICT. Internal control and compliance Division & Recovery Division. Like other commercial banks UCBL performs all traditional banking business including introduction of a wide range of saving and credit products, retail banking and subsidiary service with the support of modern technology and professional management, but the UCBL emphasizes its function in export and import trade and financing of export oriented industries will enhance wealth, quotes more employment opportunities helps formation of capital and reduces in balance in the balance of payment in the country. To err is human and forgiveness divines” a proverb, the bank believes but the customers will not accept. Because for a service they pay for they want it 100% defect free. So improvement of the customer service should always be their motto. To operate in the globalize environment, the banks future plan is to equip all the units of the bank with the modern technology, such as online service, ATM service etc. for the service of the customer round the clock, UCB launched credit cards for their customers from April 2006. The economic activities on the country as a whole wee positive and satisfactory during the year under report and the bank closed the year recording steady growth. At the end of the year 2008, total assets of the bank stood at 28812.594 million as against taka 25058.742million registering an increase of 14.98 percent. 2007 to 2008 changes little bit but from 2009 to 2010 over the time period degree of increases is significantly high. The deposit of the bank registered an increase of 17.115 percent in the year under review. At the close of 2011, Total deposit stood at TK 24559 million as against TK 20970 million in the previous year. Average deposit per branch stood at TK 306.9875 million in 2011 as against TK 262.125 million in the previous year. At the close of 2008, total investment of the bank stood at TK 2877million s against TK 3020 million in 2007.dividend amounting to Tk 1.48 million has been received from different companies/ institutions against investment in share during the year under report. SWOT analysis refers to analysis of strengths, weaknesses, opportunities and threats of an organization. This facilitates the organization to make its future performance improved in comparison to its competitors. An organization can also study its current position through SWOT analysis. For all of these, SWOT analysis is considered as an important tool for making changes in the strategic management of an organization. UCBL Bank is already well established in the banking industry of the country. It is one of the leading first generation private sector commercial banks in Bangladesh. It has got significant image in the banking industry. UCBL Bank has the reputation of being the provider of good quality services to its present and potential customers. UCBL Bank has already achieved a high growth rate. Deposits as well as loans & advances are increasing rapidly. Lack of motivation of work among some employees. Heavily depended on Head Office for decision making. Some of the job positions in the UCBL Bank have no growth or advancement path which brings job dissatisfaction among some employees. The promotional activities of the Bank are not adequate to widen its market share. UCBL Bank does not provide ATM card which limits its competence in the fast changing banking industry. UCBL Bank has more redundant manpower compared to other banks of the same generation which increases its operational cost. A large portion of our population is middle class. Different types of retail lending products have a great appeal to this class. So, a wide variety of retail lending products has a very large and easily pregnable market. Thus, UCBL Bank can adopt variety scheme for retail lending. Bank can introduce special corporate scheme for corporate customers or service holders according to the professions, such as engineers, lawyers, doctors etc. Some commercial/ foreign as well as private bank. Similar types of retail banking products. Certain Bangladesh Bank rules and regulations. Customer awareness of pricing and services. Industries are becoming sick at an increasing rate and growth of industrialization is very slow in the country. Therefore, it is very likely that poor industrial growth will affect the potentiality of UCBL Bank. Effect of operating Leverage: Since the degree of operating leverage is 1.32011 times, 26.07594937% increase in sales will result 1.32*26.075= 34.419 increases in EBIT. Effect of Financial Leverage: since the degree of financial leverage is 1.149 times 34.419 % increase in EBIT will result in 1.149*34.419%=39.547431% increase in earning per share. Degree of total Leverage: since the degree of total leverage is 1.5168%, 26.075% increases in sales resulted 1.149*26.075=39.547431% in earning per share. In 2007 it was 20% but after that it is decreasing up to 2011 then is stable over the time period. In 2007 to 2011 the ratio is decline but after that period it is gradually increasing over the time period. In 2007 to 2009 the ratio is increasing but after then it is decline over the time period. From the above table it is observed that in year 2007 Operating income and gross profit is less compared to the previous year. It is also observed that bank had to make provision for a significant amount every year from 2007 – 2011 to reduce its bad loans. But it is decreasing from year 2007 which has come down to 231 million in years 20010. It has come also increase in 2008. Its present classified loan in 4.6%. Elements of operating income and operating expenses have been discussed earlier in the table of 4.5. Gross profit is the operating income less operating expenses. Net profit of the bank is gross profit less provisions for classified and unclassified loans & advances, diminution in the value of investment in shares and the provisions for tax. Over the time period the income , gross profit and net profit all are increasing so it is very good sign from the organization point of view as well as investors. Credit risk means the risk of credit loss those results from the failure of a borrower to honor the borrower’s credit obligation to the financial institution. 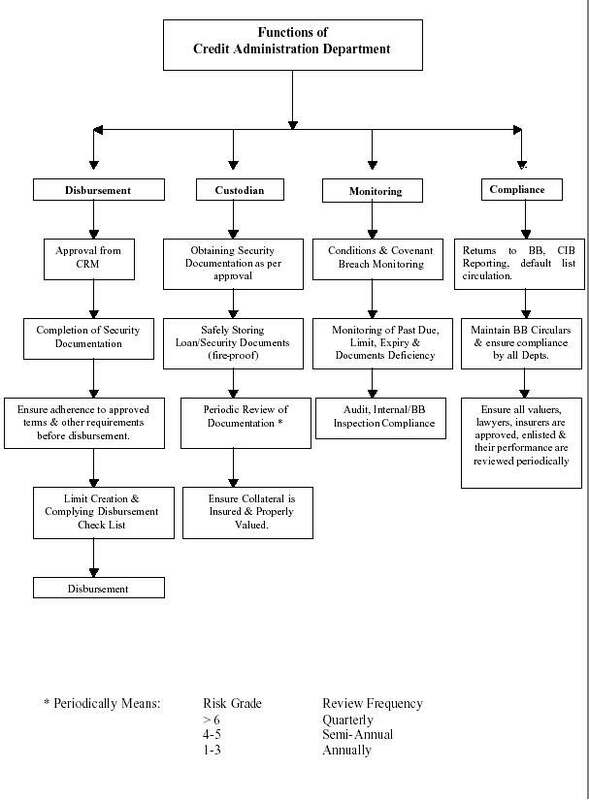 (Guideline on credit risk management, Bank of Mauritius). Credit risk is most simply defined as the potential that a bank borrower or counterparty will fail to meet its obligations in accordance with agreed terms (Basel Committee on Banking Supervision,2000). Expected losses are derived from the borrower’s expected probability of default and the predicted exposure at default less the recovery rate, i.e. all expected cash flows, especially from the realization of collateral. The expected losses should be accounted for in income planning and included as standard risk costs in the credit conditions. When aggregating risks, it is important to take into account correlation effects which cause a bank’s overall risk to differ from the sum of the individual risks. 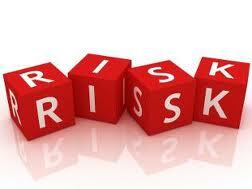 This applies to risks both within a risk category as well as across different risk categories. Management, a PRISM component, centres on what the borrower is all about, including history and prospects. Intention or loan purpose serves as the basis for repayment. Repayment focuses on internal and external sources of cash. Internal operations and asset sales produce internal cash, whereas new debt or equity injections provide external cash sources. Internal safeguards originate from the quality and soundness of financial statements, while collateral guarantees and covenants provide external safeguards. The final component, Perspective, pulls other sections together: the deal’s risks and rewards and the operating and financing strategies that are broad enough to have a positive impact on shareholder value while enabling the borrower to repay the loan (Morton Glantz 2004). The methods used show how risks are captured, measured, and aggregated into a risk position for the bank as a whole. In order to choose suitable management processes, the methods should be used to determine the risk limits, measure the effect of management instruments on the bank’s risk position, and monitor the risk positions in terms of observing the defined limits and other requirements. Processes and organizational structures have to make sure that risks are measured in a timely manner that risk positions are always matched with the defined limits, and that risk mitigation measures are taken in time if these limits are exceeded. Concerning the processes, it is necessary to determine how risk measurement can be combined with determining the limits, risk controlling, as well as monitoring. Furthermore, reporting processes have to be introduced. The organizational structure should ensure that those areas which cause risks are strictly separated from those areas which measure, plan, manage, and control these risks. As well as an automated warning mechanism prior to reaching critical risk limits. The definition of operational indicators such as core business, risk targets, and limits. The definition of limits is necessary to curb the risks associated with bank’s activities. It is intended to ensure that the risks can always be absorbed by the predefined coverage capital. When the limits are exceeded, risks must be reduced by taking such steps as reducing exposures or using financial instruments. The parameters used to determine the risks and define the limits should be taken from existing systems. The parameters should be combined using automated interfaces. This ensures that errors due to manual entry cannot occur during the data collection process. The defined indicators should be used consistently throughout the bank. The data should be consistent with the indicators used in sales and risk controlling. Employees should be able to understand how and why the indicators are determined and interpreted. This is intended to ensure acceptance of the data and the required measures, e.g. when limits are exceeded. In order to allow the use of limits to manage risks, it is necessary to define how strictly these limits should be applied. In practice, the rigidity of limits varies in terms of their impact on a bank’s business activities. Certain limits are defined rigidly and must never be exceeded, as otherwise the viability of the bank as a whole would be endangered. In addition, there are early warning indicators that indicate the risk of exceeding limits ahead of time. Some banks check the compliance with the limits immediately during the credit approval process. Prior to the credit decision, compliance with the relevant limits is checked in case the credit is approved. Bringing limit monitoring into play at this early stage is also referred to as ex-ante monitoring. This helps prevent the defined limits from being exceeded in the course of approving new loans. Ex-ante monitoring is quite complex. The limit utilization has to be documented in the credit risk report. Processes and responsibilities concerning measures to be taken when limits are exceeded have to be defined clearly. The decision makers responsible have to be informed depending on the extent to which the limits are exceeded and the approach taken to remedy the situation. Credit risk management process should cover the entire credit cycle starting from the origination of the credit in a financial institution’s books to the point the credit is extinguished from the books (Morton Glantz, 2002). Credit processing is the stage where all required information on credit is gathered and applications are screened. Credit application forms should be sufficiently detailed to permit gathering of all information needed for credit assessment at the outset. In this connection, financial institutions should have a checklist to ensure that all required information is, in fact, collected. Financial institutions should set out pre-qua action screening criteria, which would act as a guide for their officers to determine the types of credit that are acceptable. For instance, the criteria may include rejecting applications from blacklisted customers. These criteria would help institutions avoid processing and screening applications that would be later rejected. Moreover, all credits should be for legitimate purposes and adequate processes should be established to ensure that financial institutions are not used for fraudulent activities or activities that are prohibited by law or are of such nature that if permitted would contravene the provisions of law. Institutions must not expose themselves to reputation risk associated with granting credit to customers of questionable repute and integrity. The next stage to credit screening is credit appraisal where the financial institution assesses the customer’s ability to meet his obligations. Institutions should establish well designed credit appraisal criteria to ensure that facilities are granted only to creditworthy customers who can make repayments from reasonably determinable sources of cash flow on a timely basis (Morton Glantz, 2002). Financial institutions usually require collateral or guarantees in support of a credit in order to mitigate risk. It must be recognized that collateral and guarantees are merely instruments of risk mitigation. They are, by no means, substitutes for a customer’s ability to generate sufficient cash flows to honor his contractual repayment obligations. Collateral and guarantees cannot obviate or minimize the need for a comprehensive assessment of the customer’s ability to observe repayment schedule nor should they be allowed to compensate for insufficient information from the customer. Care should be taken that working capital financing is not based entirely on the existence of collateral or guarantees. Such financing must be supported by a proper analysis of projected levels of sales and cost of sales, prudential working capital ratio, past experience of working capital financing, and contributions to such capital by the borrower itself. Financial institutions must have a policy for valuing collateral, taking into account the requirements of the Bangladesh Bank guidelines dealing with the matter. Such a policy shall, among other things, provide for acceptability of various forms of collateral, their periodic valuation, process for ensuring their continuing legal enforceability and realization value (Morton Glantz, 2002). management capacity of corporate customers (L.R.Chowdhury,2004). A financial institution must have in place written guidelines on the credit approval process and the approval authorities of individuals or committees as well as the basis of those decisions. Approval authorities should be sanctioned by the board of directors. Approval authorities will cover new credit approvals, renewals of existing credits, and changes in terms and conditions of previously approved credits, particularly credit restructuring, all of which should be fully documented and recorded. Prudent credit practice requires that persons empowered with the credit approval authority should not also have the customer relationship responsibility. Approval authorities of individuals should be commensurate to their positions within management ranks as well as their expertise. Depending on the nature and size of credit, it would be prudent to require approval of two officers on a credit application, in accordance with the Board’s policy. The approval process should be based on a system of checks and balances. Some approval authorities will be reserved for the credit committee in view of the size and complexity of the credit transaction. Depending on the size of the financial institution, it should develop a corps of credit risk specialists who have high level expertise and experience and demonstrated judgment in assessing, approving and managing credit risk. An accountability regime should be established for the decision-making process, accompanied by a clear audit trail of decisions taken, with proper identification of individuals/committees involved. All this must be properly documented. Documentation is an essential part of the credit process and is required for each phase of the credit cycle, including credit application, credit analysis, credit approval, credit monitoring, and collateral valuation, and impairment recognition, foreclosure of impaired loan and realization of security. The format of credit files must be standardized and files neatly maintained with an appropriate system of cross-indexing to facilitate review and follow up. The Bangladesh Bank will pay particular attention to the quality of files and the systems in place for their maintenance. Documentation establishes the relationship between the financial institution and the borrower and forms the basis for any legal action in a court of law. Institutions must ensure that contractual agreements with their borrowers are vetted by their legal advisers (L. R. Chowdhury, 2004). Credit applications must be documented regardless of their approval or rejection. All documentation should be available for examination by the Bangladesh Bank. Financial institutions must establish policies on information to be documented at each stage of the credit cycle. The depth and detail of information from a customer will depend on the nature of the facility and his prior performance with the institution. A separate credit file should be maintained for each customer. If a subsidiary file is created, it should be properly cross-indexed to the main credit file (L. R. Chowdhury, 2004). For security reasons, financial institutions should consider keeping only the copies of critical documents (i.e., those of legal value, facility letters, and signed loan agreements) in credit files while retaining the originals in more secure custody. Credit files should also be stored in fire-proof cabinets and should not be removed from the institution’s premises. Financial institutions should maintain a checklist that can show that all their policies and procedures ranging from receiving the credit application to the disbursement of funds have been complied with. The checklist should also include the identity of individual(s) and/or committee(s) involved in the decision-making process (Morton Glantz, 2002). Financial institutions must ensure that their credit portfolio is properly administered, that is, loan agreements are duly prepared, renewal notices are sent systematically and credit files are regularly updated. An institution may allocate its credit administration function to a separate department or to designated individuals in credit operations, depending on the size and complexity of its credit portfolio (Credit Risk Management: Industry Best Practices2005, Bangladesh Bank). On-site inspection visits of the borrower’s business are regularly conducted and assessments documented (L.R.Chowdhury, 2004). Once the credit is approved, the customer should be advised of the terms and conditions of the credit by way of a letter of offer. The duplicate of this letter should be duly signed and returned to the institution by the customer. The facility disbursement process should start only upon receipt of this letter and should involve, inter alia, the completion of formalities regarding documentation, the registration of collateral, insurance cover in the institution’s favour and the vetting of documents by a legal expert. Under no circumstances shall funds be released prior to compliance with pre-disbursement conditions and approval by the relevant authorities in the financial institution (L.R. Chowdhury, 2004). To safeguard financial institutions against potential losses, problem facilities need to be identified early. A proper credit monitoring system will provide the basis for taking prompt corrective actions when warning signs point to deterioration in the financial health of the borrower. 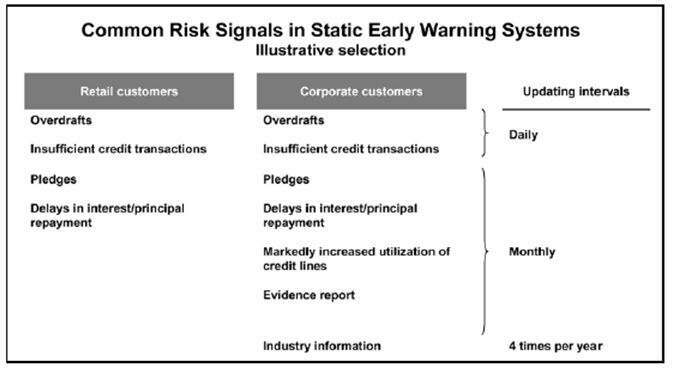 Examples of such warning signs include unauthorised drawings, arrears in capital and interest and deterioration in the borrower’s operating environment (Morton Glantz, 2002). Financial institutions must have a system in place to formally review the status of the credit and the financial health of the borrower at least once a year. More frequent reviews (e.g. at least quarterly) should be carried out of large credits, problem credits or when the operating environment of the customer is undergoing significant changes. Problem credits are promptly directed to management for remedial actions. Any relevant board resolutions for corporate customers. The borrower should be asked to explain any major variances in projections provided in support of his credit application and the actual performance, in particular variances respecting projected cash flows and sales turnover (Credit Risk Management: Industry Best Practices2010, Bangladesh Bank). An important element of sound credit risk management is analysing what could potentially go wrong with individual credits and the overall credit portfolio if conditions/environment in which borrowers operate change significantly. The results of this analysis should then be factored into the assessment of the adequacy of provisioning and capital of the institution. Such stress analysis can reveal previously undetected areas of potential credit risk exposure that could arise in times of crisis (Morton Glantz, 2002). Financial institutions should have industry profiles in respect of all industries where they have significant exposures. Such profiles must be reviewed /updated every year. Each stress test should be followed by a contingency plan as regards recommended corrective actions. Senior management must regularly review the results of stress tests and contingency plans. The results must serve as an important input into a review of credit risk management framework and setting limits and provisioning levels (Morton Glantz, 2002). Credit classification process grades individual credits in terms of the expected degree of recoverability. Financial institutions must have in place the processes and controls to implement the board approved policies, which will, in turn, be in accord with the proposed guideline. They should have appropriate criteria for credit provisioning and write off. International Accounting Standard 39 requires that financial institutions shall, in addition to individual credit provisioning, assess credit impairment and ensuing provisioning on a credit portfolio basis. Financial institutions must, therefore, establish appropriate systems and processes to identify credits with similar characteristics in order to assess the degree of their recoverability on a portfolio basis. Financial institutions should establish appropriate systems and controls to ensure that collateral continues to be legally valid and enforceable and its net realizable value is properly determined. This is particularly important for any delinquent credits, before netting off the collateral’s value against the outstanding amount of the credit for determining provision. As to any guarantees given in support of credits, financial institutions must establish procedures for verifying periodically the net worth of the guarantor. A financial institution’s credit risk policy should clearly set out how problem credits are to be managed. The positioning of this responsibility in the credit department of an institution may depend on the size and complexity of credit operations. The monitoring unit will follow all aspects of the problem credit, including rehabilitation of the borrower, restructuring of credit, monitoring the value of applicable collateral, scrutiny of legal documents, and dealing with receiver/manager until the recovery matters are finalized. The collection process for personal loans starts when the account holder has failed to meet one or more contractual payment (Installment). It therefore becomes the duty of the Collection Department to minimize the outstanding delinquent receivable and credit losses. This procedure has been designed to enable the collection staff to systematically recover the dues and identify / prevent potential losses, while maintaining a high standard of service and retaining good relations with the customers. It is therefore essential and critical, that collection people are familiar with the computerized system, procedures and maintain effective liaison with other departments within the bank (Prudential regulations for consumer financing 2004, Bangladesh Bank). The collector’s responsibility will commence from the time an account becomes delinquent until it is regularized by means of payment or closed with full payment amount collected. The goal of the collection process is to obtain payments promptly while minimizing collection expense and write-off costs as well as maintaining the customer’s goodwill by a high standard of service. For this reason it is important that the collector should endeavor to resolve the account at the first time worked. Collection also protects the assets of the bank. This can be achieved by identifying early signals of delinquency and thus minimizing losses. The customers who do not respond to collection efforts – represent a financial risk to the institution. The Collector’s role is to collect so that the institution can keep the loan on its books and does not have to write-off / charge off. When a customer fails to pay the minimum amount due or instalment by the payment due date, the account is considered in arrears or delinquent. When accounts are delinquent, collection procedures are instituted to regularize the accounts without losing the customer’s goodwill whilst ensuring that the bank’s interests are protected. Legal actions could be taken on the basis of Artha Rin Adalat Ain 2003 which has been enacted to encourage speedy settlement of legal cases. It provides support for both the financial institutions and the borrower. a) The credit risk management process of United commercial Bank Limited is quite commendable. Systematic and timely monitoring and appropriate documentation are tried to be maintained. b) Customer satisfaction level is quite good. Informal conversation with some customers reveals that they approve the credit evaluation and management process of United commercial Bank Ltd.
c) Filing procedure is not maintained in a definite and clear manner. It is difficult to locate the documents in a chronological and sequential manner. A definite practice, though mentioned in the credit policy is not always maintained by the credit officials. d) The credit sanction and disbursement procedure is quite lengthy. e) Networking system in United commercial Bank Limited has to be improved. Network gets disconnected several times a day which causes delays in the overall process and other operations of the bank. a) An uninterrupted network system has to be ensured. It will save the officials from much hassle and will save time. b) The credit sanction procedure should be made quicker since competition is very hard in today’s business world. People do not want to wait for three to four weeks on an average to get a loan which is even protected by security. c) Decision making process can be made more decentralized. Participative approach should be adopted to gain prompt and effective result. d) Filing is a very important component of proper documentation. It has to be dealt with importance. Credit risk management is becoming more and more important in today’s competitive business world. It is all the more important in the context of Bangladesh. The tools for improving management of consumer credit risk have advanced considerably in recent years. Therefore, as a responsible and reputed commercial bank, UCBL has instituted a contemporary credit risk management system. From the study, it is evident that the bank is quite sincere in their approach to managing the consumer credit risk though there are rooms for improvement. They have to be more cautious in the recovery sector and preferential treatments to some big clients should also be stopped. However, they follow an in-depth procedure in assessing the credit risk by using the credit risk grading techniques which provides them a solid ground in the time of any settlement. From the discussion in this report, it has become clear that credit risk management is a complex and on going process and therefore financial institutions must take a serious approach in addressing these issues. They have to be up to date in complying with all the required procedures and must employ competent people who have the ability to deal with these complex matters. Utmost importance should be given to the improvement of the networking system which is essential for modern banking environment and obviously for efficient and effective credit risk management process.